To most non-Italians, pizza means one thing: a round of doughy crust topped with tomato and mozzarella. In Italy however there are about as many types of pizza as pasta. We know it can be overwhelming so we have written a guide of the classics so you know just what to order! 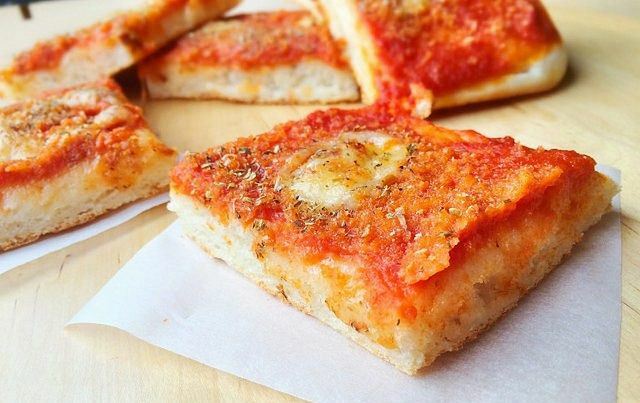 Roman pizza is practically the opposite to Neapolitan pizza: it is crispy and they are not afraid of toppings. 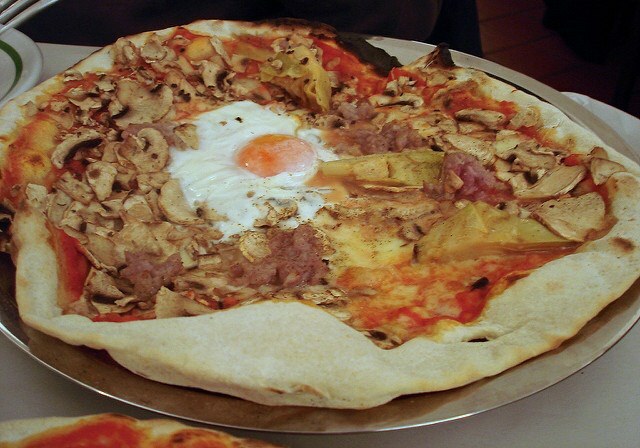 A classic on all menus in Rome is the Capricciosa: topped with ham, mushrooms, olives, artichoke, an egg and tomato. Oil is added to the dough and there is much less water than the Naples version. The pizza is cooked for up to 3 minutes at around 350°C and therefore the result is something completely different to the pizza of Naples: way crispier. All over Rome you can find round pizza or ‘al taglio’ which is by the slice. Long strips of pizza are topped with the most delicious toppings and then cut and sold by weight and wrapped in paper. 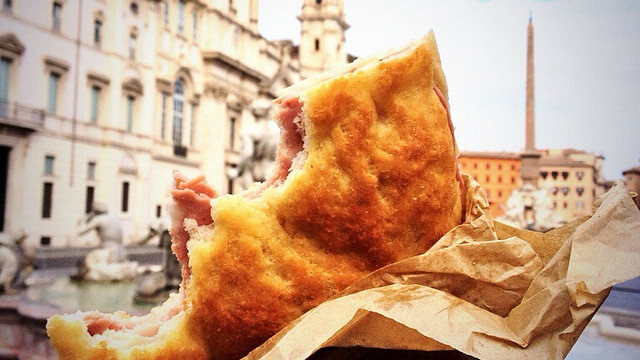 It is original Roman street food and it is an institution of the city loved by all but you can also find it all over Italy. If you want to learn how to make Roman pizza from scratch, join us for a pizza & gelato class at In Rome Cooking! Sicilian pizza has a thick spongy dough and is probably most similar to American style pizza as many Sicilians migrated to the US which inevitably influenced the food of America. Sicily grows extraordinary durum wheat and their pizza benefits from the delicious flavour of the rich flour. Of course, the local tomatoes and oregano also make for bold and delicious toppings. The dough is left to rise from 2 hours to 72 hours and then cooked at around 300°C for 3 or 4 minutes. All over Sicily you can find food carts selling hot slices of ‘Sfincione’- typical Sicilian pizza, ideal with a cold beer enjoyed in the sun. 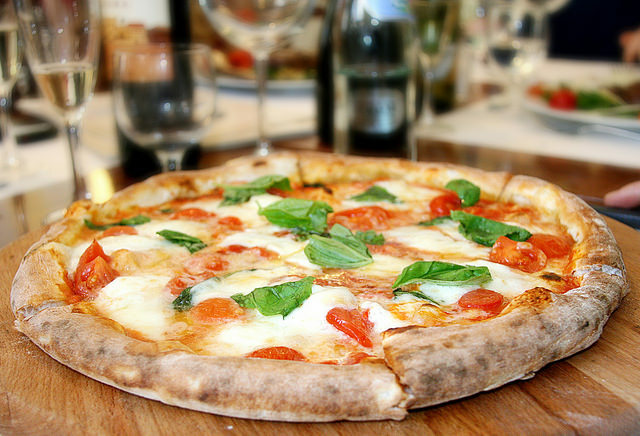 Pizza without sauce may seem strange but it has been a favourite of Italians since Roman times. In fact, menus here usually differentiate between ‘red pizza’ with sauce and ‘white pizza ‘without sauce. Both are delicious and it serves well to order from each and share between two. The Ancient Romans used to cut their pizza in two and eat it with figs or cheese and chicory at 11:00 on the dot. Nowadays in Rome, the most popular filling is mortadella, a ham from Bologna sometimes studded with pistachios which pares so well with fresh white pizza. Tuscany has their own version ‘Schiacciata toscana all’olio’, an old farmer dish that was pressed- or ‘Schiacciato’ on a red- hot stone and then filled with local hams, cheese and vegetables. It is now a feature in bakeries all over Florence. Fun fact: both schiacciata toscana and pizza bianca were first used to check the temperature of the bricks before cooking the bread for the week. So next time you come to Italy you will know exactly which pizza to order in which city!